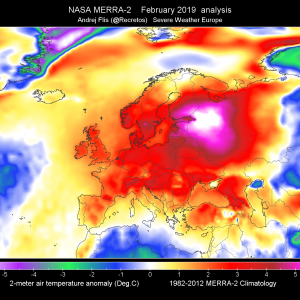 An upper ridge begins to strenghten across west-central Europe while ridge across Balkan peninsula weakens. A deep upper low slowly weakening across SW Europe. Another through moves south across E Europe from the Scandinavia. Deep trough and cyclone result in a windstorm from Iceland towards Norwegian sea and N Scandinavia. 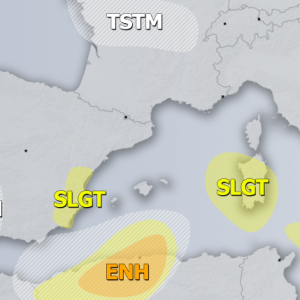 ENH/SLGT risks have been issued for NW Mediterranean into extreme NE Spain and extreme S France with threat for severe storms, capable of producing large hail, severe winds and tornadoes. Strong LL jet from the ESE directions will result in excessive rainfall into E Pyrenees and W Alps. WNTR risks have been issued for E Pyrenees and W Alps with threat for excessive snowfall, locally more than 50cm fresh snow in the mountains is likely (W Alps). 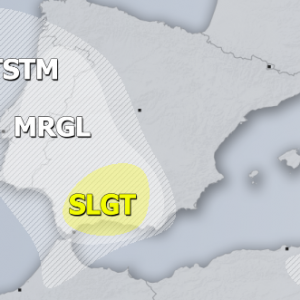 A SLGT risk has been issued for parts of W Spain and S Portugal with threat for isolated severe storms, capable of producing large hail, severe winds and heavy rainfall. A MDT risk has been issued across N parts of Norwegian sea into extreme N Norway with threat for severe to extremely severe non-convective wind gusts, locally in excess of 140 km/h. ENH/SLGT risks have been issued surrounding the MDT risk area and extended westwards across Iceland with threat for severe to extremely severe non-convective wind gusts, locally well in excess of 120 km/h. TSTM risk area extended across W Iberia, S-CNTRL France and parts of N-CNTRL Italy with threat for some isolated storms, marginal hail and severe winds are still possible. 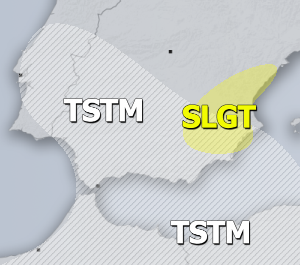 TSTM risk areas have been issued across SW Balkan countries and S Ukraine/Moldova with threat for some isolated storms in the afternoon.